Bouvier Pharmacy was dissatisfied with the quality of their display lighting. They were tired of paying high electric bills to power lights that failed to enhance their retail space. Trust Energy designed a customized solution to improve the look and feel of the store both inside and out. 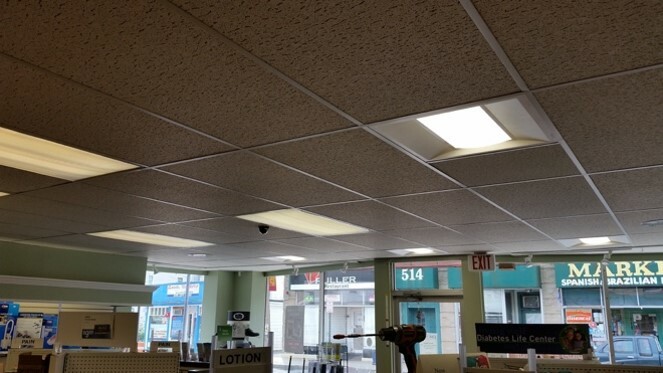 The lighting upgrade saves 13,189 kWh, reducing Bouvier Pharmacy’s electricity consumption by 34% and reducing their electric bill by 56%. Carbon Footprint Reduction: 20,434 lbs. Trust Energy installed new LED fixtures and redesigned the lighting layout, which really improved the look and feel of the store. The new lights use less electricity and the new layout means we don’t need as many lights, so we’re saving a lot of energy and reducing our carbon footprint.